While the museum displays finds from many eras, it brings to life the story of the Cretaceous period, showcasing fossils and bones from super-sized sea reptiles and fish who lived here when a vast inland sea covered the state.My boys were excited to visit, pumped up on their knowledge of paleontology from the PBS show Dinosaur Train and a very cool National Geographic special called “Sea Monsters” which re-enacts some of the major fish finds in Kansas. Western Kansas is known worldwide as one of the most fertile Cretaceous period fossil hunting regions in the world. This time was the last period of the age of dinosaurs. The shallow sea that covered Kansas in the Cretaceous contained ferocious creatures whose remains, left behind on the ocean floor, became embedded in the limestone foundation of the plains we are so familiar with today. 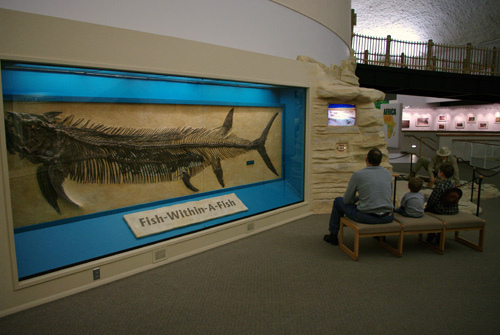 One of the highlights of the museum is the most photographed fossil in the world – a Fish-Within-a-Fish found 50 miles west of Hays in Gove County. The unique find shows a 14-foot long fish with its 6-foot long dinner-fully intact - in its stomach.While that fossil is a big draw, the museum offers so much more, including a two-story walk through experience with life-size models of the sea monsters in Kansas and some of the dinosaurs that would have walked along the western sea shore in Colorado. BEWARE: The T-Rex moves! That part scared my five-year-old, but he thought it was pretty cool to get to see the bones of real sea monsters. My kids also enjoyed the recently installed fossil-dig pit, for the hands on experience of digging for dinosaurs. There is also a discovery room where they could touch things and learn about the Natural world. A great display on dinosaur eggs also had lot of things for the kids to touch and explore. For their temporary exhibits, the museum goes beyond the fossil past of Kansas to feature other unique natural history treasures. I enjoyed a display of 80 original oil paintings by John Cody. These amazing depictions of giant silk moths showcase the beauty of these unique insects. 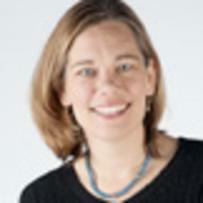 They will soon host the world premier of an exhibit called "Peanuts Naturally" created by the Charles Schultz museum. Opening on Earth Day 2011, the display includes Peanuts cartoons that deal with nature. If your kids are fans of the Dinosaur Train too, the museum is hosting a special day with “Buddy” on March 12, where kids can get their picture taken with the cute and huggable version of the T-Rex, before they see a life-sized one. This is a very “do-able” museum. If you are taking a day-trip and can take your time, there is plenty to see to make it a worthy destination. If you are making it part of a larger trip, you can get a good overview of the exhibits in about an hour. It is easy to access from I-70, scores high for family fun, and has enough variety to capture attention at any age.